Share this with your friends with the buttons below. Ed Leedskalnin, known for his amazing construction marvel Coral Castle, is credited with inventing a “Perpetual Motion Holder”, which consists of a U shaped core with a coil on both sides that are connected in criss-cross fashion. 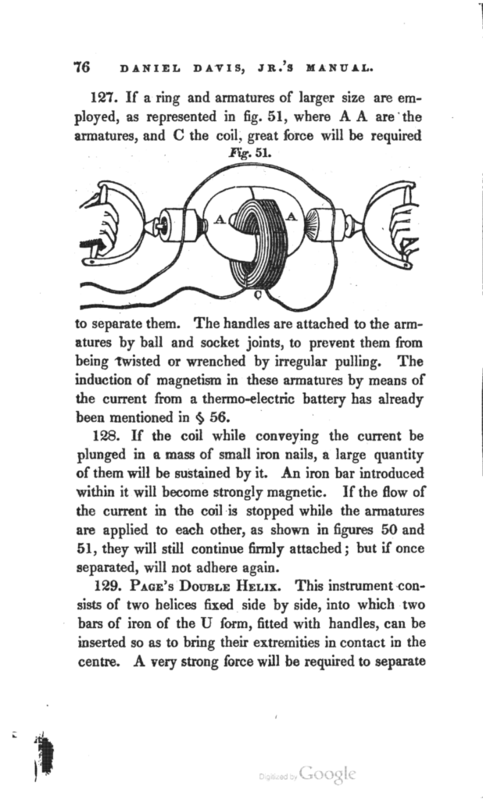 There is an iron keeper that closes the gap and when a battery is connected to the two coils, the keeper stays magnetized to the U permanently. This causes an internal magnetic current to run in the loop perpetually and when the keeper is finally removed by force, the magnetic field collapses and it causes the coils to output electricity. 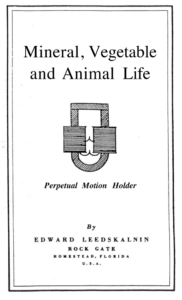 The image above is a book cover to one of Ed Leedskalnin’s books, Mineral, Vegetable and Animal Life, which has the Perpetual Motion Holder depicted on the cover. The Perpetual Motion Holder works as claimed and it is easy to build. 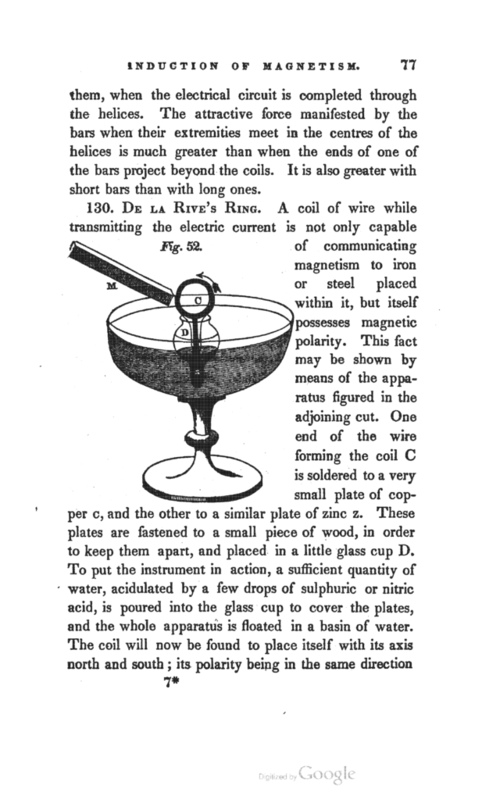 What is interesting is that it is normally thought that current has to be supplied to the coils in order for the metal to become magnetized and when the current is removed, the magnetization disappears. However, this is not the case as is easily demonstrated by the Perpetual Motion Holder. Many people have had these devices magnetized for many, many years and no matter how long, when the remove the keeper, the coils output a pulse of electricity. It can be measured with a meter or you can see that it will light an LED, etc. Einstein said that the key to creativity is to hide one’s sources and in this case, that is exactly what Ed Leedskalnin did. 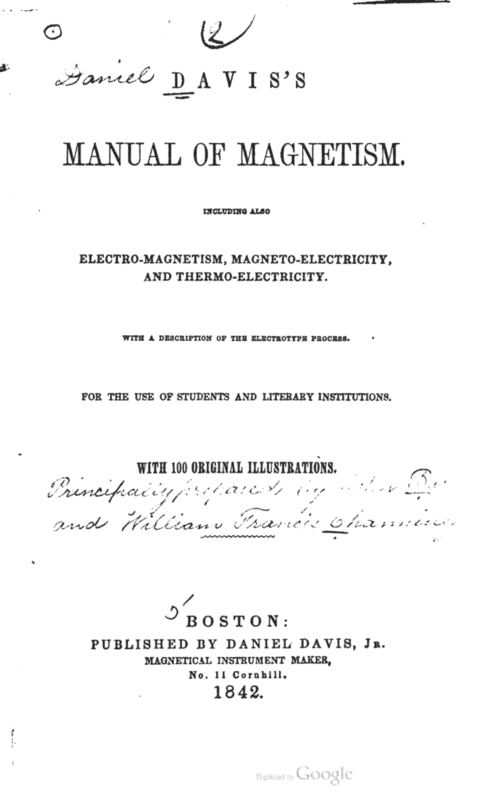 It was known that Leedskalnin was very studious and he examined much of the literature of his day regarding electricity, magnetism, biology, etc. 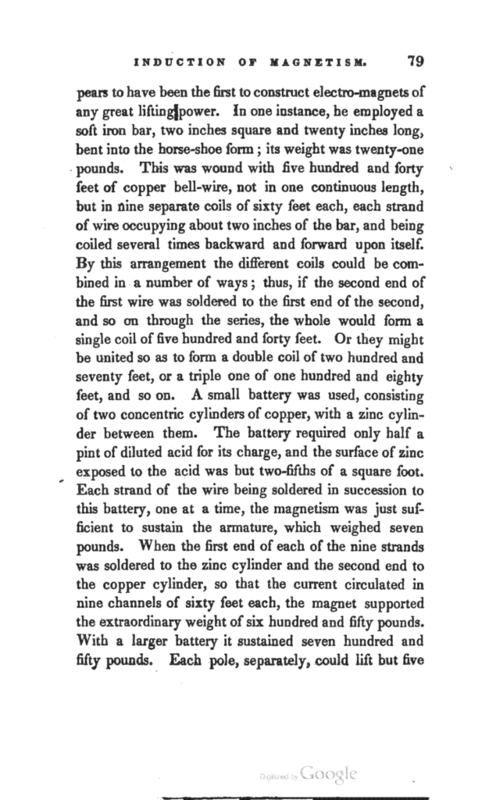 During this time, one of the most famous books on magnetism, which is still a valuable resource was first published in the 1840’s and spelled out the Perpetual Motion Holder, but with a very different name – 100% exact explanation of the results of the device. 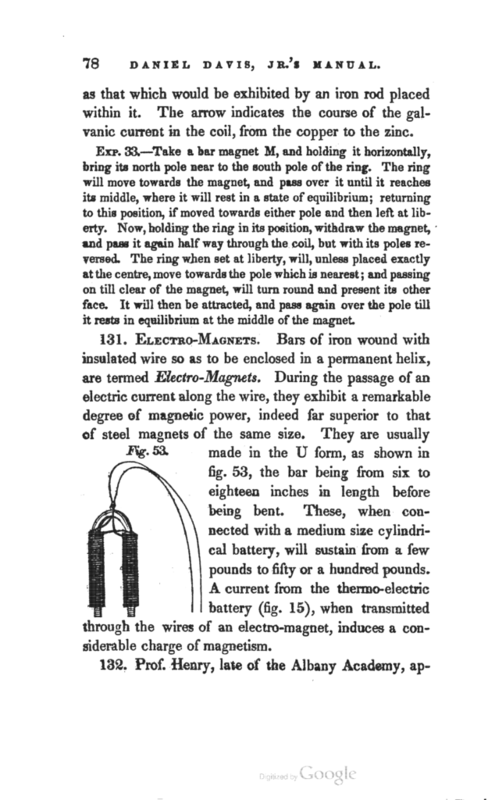 Davis’s Manual on Magnetism was one of the first and most popular books that detailed this device and virtually every technically oriented scholar at Princeton in that day knew of it. This is NOT the first reference to this device, but it is one of many from it’s time. There is an earlier reference and we’ll get to that soon. 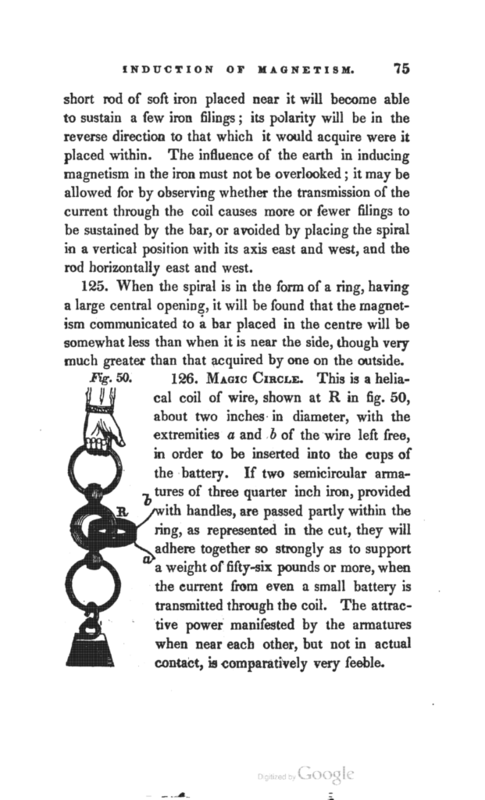 You can see on page 75 above that image 126’s description is that of the Magic Circle – the original name for the Perpetual Motion Holder. If you have two semi-circles attached with a coil of wire around a side of this circle and charge it, the two iron semi-circles with stick together. If you remove the electricity, they continue to stick. Below, you see in Fig. 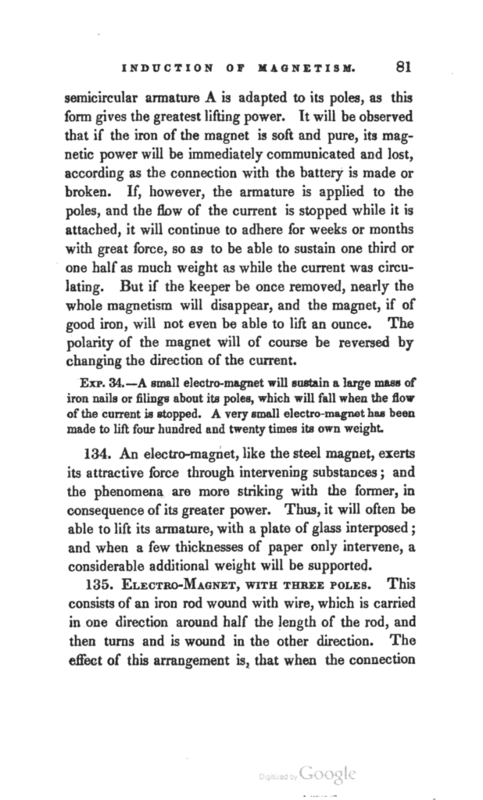 53, the classic “STRONG” type of electromagnet as used by Ed Leedskalnin and is apparently invented by Prof. Henry who is mentioned in section 132 at the bottom of the page. We’ll discuss Prof. Henry soon. Above is an image of another variation of the Magic Circle, which is designed for much stronger variations. It is a hybrid between the original Magic Circle and the strong electromagnet with coils on both legs of the horseshoe shaped core. That statement reveals that some of the power actually is lost after removing the battery, but for the most part, it sticks until manually removed – or until electricity with the opposite current is applied. 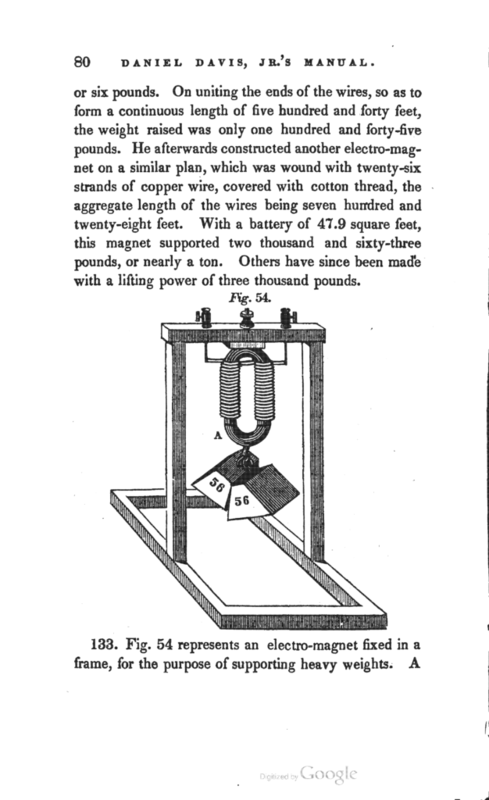 So there you have it, the full revelation of the “Perpetual Motion Holder from the 1840’s. 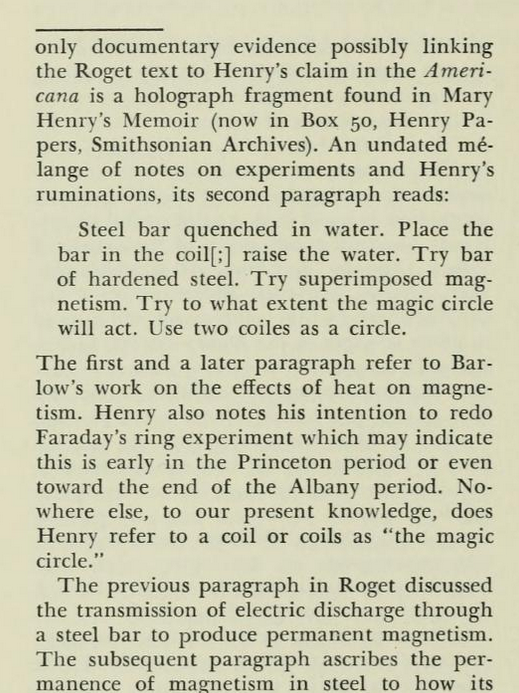 The mention of Prof. Henry is very important because not only is he the inventor of these stronger electromagnets that went way beyond what anyone had developed before, but he appears to also be the inventor of the Magic Circle. Joseph Henry was a contemporary of Michael Faraday and independently discovered the Laws of Electromagnetic Induction but about on year after Faraday. The unit of measurement for inductance is named after Joseph Henry. In some of Joseph Henry’s notes, which are documented in a book called The Paper of Joseph Henry edited by Nathan Reingold, we see the earliest mention of the Magic Circle. This book details papers by Joseph Henry from November 1832 to December of 1835, which are called “The Princeton Years”. Clearly, the editor of the book had absolutely no idea what the reference to the Magic Circle meant, but now you do! And it was in Joseph Henry’s notes around 50 years before Ed Leedskalnin was ever born. This is the origin of the Perpetual Motion Holder, what is was originally called and who invented it. Please give credit where credit is due. The next time someone tells you about the Perpetual Motion Holder by Ed Leedskalnin, please kindly refer them to this page. 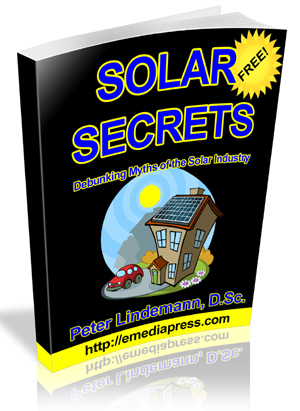 Please understand that this is not intended to take anything away from Ed Leedskalnin’s very interesting work but rather to correct a common misunderstanding about the Perpetual Motion Holder. The operating theory behind what maintains that magnetism is a whole other topic, but suffice to say, there is a magnetic current that is put into circulation around the loop. 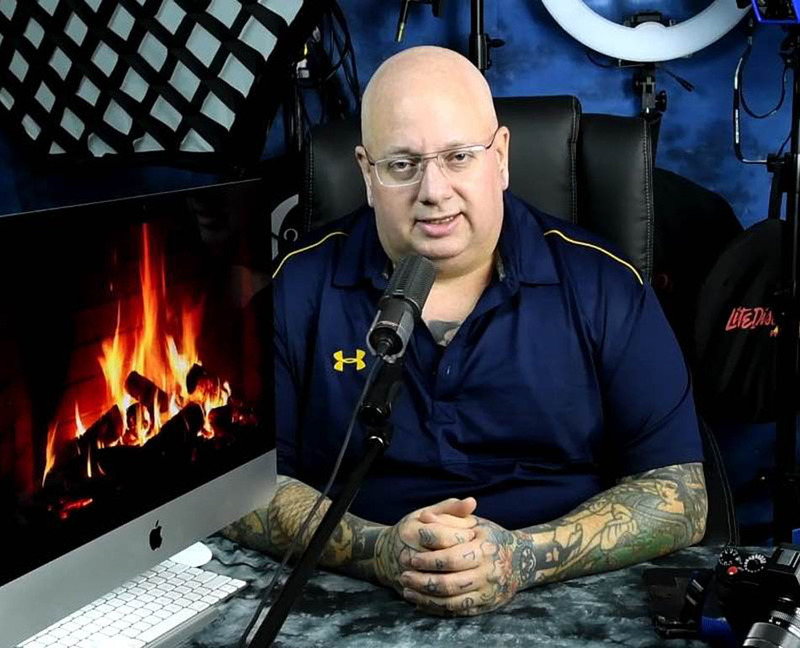 Many conventionally minded people do not believe in magnetic currents as they think a piece of metal that is magnetized only has a static field that just sits there. My opinion is that they are wrong, but that is another story. 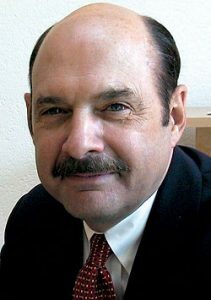 Many years ago, John Bedini and I were discussing toroidal coils and he shared with me his belief that there is a magnetic current that is always in circulation around the ferrite core. The question then is how do we tap it for energy production? We did not come to a satisfactory answer, but something along these lines is possibly happening with Steve Marks’s TPU (Toroidal Power Unit). One thing you might find very interesting is that conventional science has indeed discovered a never-ending perpetual electrical current in circulation in closed metal rings. Abstract says: Quantum mechanics predicts that the equilibrium state of a resistive metal ring will contain a dissipationless current. This persistent current has been the focus of considerable theoretical and experimental work, but its basic properties remain a topic of controversy. The main experimental challenges in studying persistent currents have been the small signals they produce and their exceptional sensitivity to their environment. We have developed a technique for detecting persistent currents that allows us to measure the persistent current in metal rings over a wide range of temperatures, ring sizes, and magnetic fields. Measurements of both a single ring and arrays of rings agree well with calculations based on a model of non-interacting electrons. Share this with your friends with the buttons below!